Linde plans to once again significantly expand its portfolio of lithium-ion-drive industrial trucks by the end of this year. Sales of the first counterbalance trucks with 90V Li-ION batteries have just begun. Featuring load capacities of 2, 2.5 or 3 tons, these models, including the corresponding roadster versions, showcase low-maintenance, long-life, and energy-saving batteries, as well as strong driving and lifting performance. 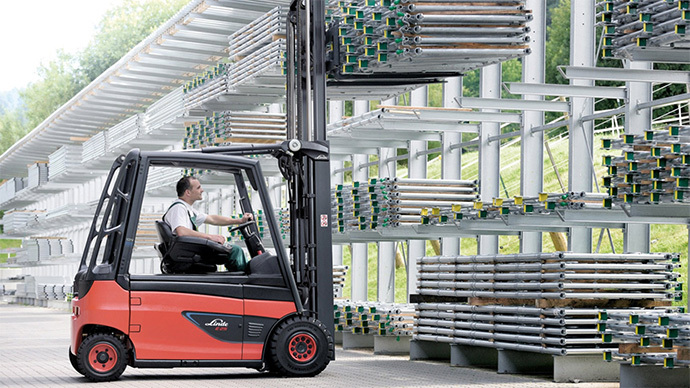 With its first counterbalance trucks, Linde E20 to E30, Linde has opened up another large segment for innovative lithium-ion battery technology. Featuring load capacities of 2, 2.5 or 3 tons, these models including the corresponding roadster versions boast low-maintenance, long-endurance, and energy-saving batteries, as well as strong driving and lifting performance. Following on from the launch of their “little brothers” with load capacities of between 1.4 and 1.8 tons in late 2016, with its Linde E20 to E30 counterbalance trucks Linde has now opened up another large segment for innovative lithium-ion battery technology. Stefan Prokosch, Head of Product Management Counterbalance Trucks at Linde Material Handling, is sure that the numerous benefits of lithium-ion technology will be increasingly reflected in sales figures. “We’re receiving consistently positive feedback from customers who are already using the smaller series lithium-ion powered trucks,” says Prokosch. “The technology is reliable and extremely energy-efficient, and it is very easy to handle,” he emphasizes. This is due to constant applied voltage, up to 30 percent higher net energy yield, greater availability due to intermediate charging being possible at any time, and long service life. Moreover, Li-ION equipment eliminates the need for battery changes, servicing, and maintenance measures. Linde’s generous warranty for lithium-ion batteries, which covers eight years, guarantees a high level of investment security for users. Should a warranty claim occur within the first three years, the battery will be repaired or replaced free of charge. Later on, the claim is handled depending on the battery’s age or the number of full charge cycles. The charger comes with a warranty of 24 months or 6,000 charging hours. To provide sufficient power supply for the electric trucks, Linde has placed great emphasis on an intelligent set-up of the lithium cells, which as a result provide an almost consistent voltage of 90V. This reduces the thermal load on the vehicle components, even under heavy-duty performance and verifiably more efficient energy utilization. Initially, two battery sizes are available: The smaller capacity battery has 24.1 kWh output, the larger one provides 60.3 kWh. Three different compatible chargers (9 kW, 17 kW, and 30 kW) can be combined with these batteries as needed. The connection chosen depends on the individual application. Linde’s lithium-ion technology has proven its worth not least due to high inherent system safety. While injuries from leaking battery acids and gases, or crush injuries due to improper battery replacement occur repeatedly during the maintenance and servicing of lead-acid batteries, the maintenance-free lithium-ion battery eliminates these dangers from the outset. At the same time, the multi-stage Linde safety concept rules out damage and failures resulting from overpressure, overheating, and over or deep discharge. Like a “safety radar”, the battery management system continuously monitors all relevant parameters and puts the vehicle in a controlled state in the event of a technical defect. A massive steel battery compartment protects the battery cells from damage from the outside. During a crash test, Linde proved impressively what high forces this compartment can withstand. A fully loaded 8-ton high-speed forklift crashed into the side of a 3-ton lithium-ion truck, but the fork arms failed to penetrate the robust battery compartment. A key advantage of the Linde solution is the CE marking, which the truck manufacturer issues for the entire vehicle including battery. “For our lithium-ion equipment, we do not merely replace the battery. Rather, we develop a complete solution for each model along with renowned partners. As a result, the battery and truck are perfectly matched to each other,” emphasizes Prokosch.